AV Voice Changer Diamond for Windows 10 - A fun application designed for voice synchronization with a microphone. With it, you can change the sound of your own voice during communication through social communication programs. The utility has a wide range of standard voices, among which you can find: children, women, men, old. The program supports various multimedia formats, such as: WMA, MP3, OGG, AIF, MP2. The application has a user-friendly interface, with a detailed location of the main tools. Good optimization provides maximum performance. 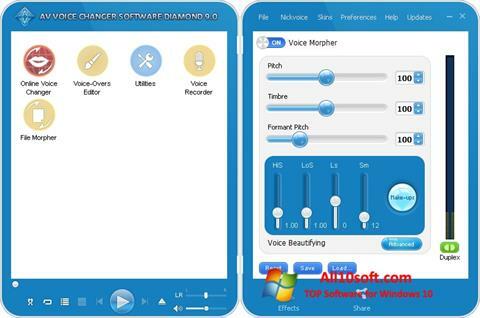 You can free download AV Voice Changer Diamond official latest version for Windows 10 in English.